ow well do you know Roskilde? If you think you know the city well, let us take you about 600 years back in time to the year 1400, and visit the city. The time period is called the late medieval period (1340-1536), and Denmark is ruled by Queen Margrethe (the first) – but the real power lies with the richest clergy and the noble landlords. 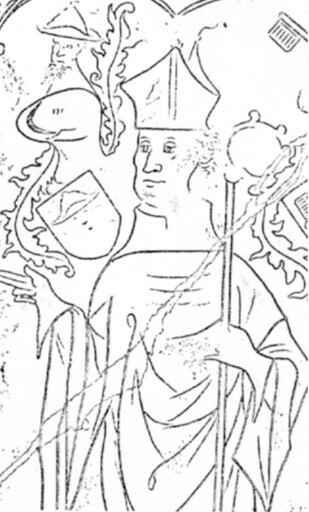 In the year 1400 had Roskilde yet its full economic and political strength, not least thanks to Bishop Peder Jensen Lodehat (1395-1416), who was Queen Margrethe’s longtime friend and adviser. Bishopric large estates incl. the main city of Copenhagen, were intact. Valdemar had admittedly in 1350 forced the bishop to hand over Copenhagen, but her daughter Margrethe delivered it back to the bishop. The decline of Roskilde started immediately after the death of Peder Jensen Lodehat. Margrethe’s successor Erik of Pomerania took Copenhagen back to the crown in 1417, and the relationship between king and bishop were strained for several years. Episcopate, the city’s monasteries and clergy at the cathedral (canons) held a total of up to half of all land and properties on Zealand, Mon and Rügen in Germany, which was part of the Roskilde diocese. Revenues from all of these possessions in the form of taxes flowed in a steady stream to the bishop’s palace, the clergy and monasteries in Roskilde, and this wealth among a large group in town, that is not even performed physical labor, fueled a lot of artisans and merchants in the city. When it went less well for the episcopal see, it was therefore unfortunate for the city. At the same time Roskilde experienced that foreign trade gradually moved to Copenhagen and Køge, both of which had a much more favorable position in relation to foreign trade. The city’s importance decreased slowly through the 1400s, and went completely downhill after the Reformation in 1536 when the entire ecclesiastical hierarchy disappeared and the Crown confiscated all possesions owned by the episcopal see, and the majority of churches and monasteries properties. The episcopal see moved to Copenhagen. The population of Roskilde was 6-8,000 in 1400, and it dropped below 2,000 after the Reformation. First, in the 1800s the town began to grow and in 1900 the population exceeded 8,000 again. The model of Roskilde 1400 thus show the city in its heyday just before it started to go downhill. The big change between the High medieval period and late medieval period was the great epidemic of plague, the Black Death that struck Europe 1347-52. This and the many recent epidemics was of great importance for the subsequent development of society. Most importantly was that the peasants charges to landlords fell, and that almost all farms were converted to medium-sized family farms. The peasants who survived the plague, got better terms. The power of the kingdom’s importance in society is strengthened and at the end of the 1300s could now strong kingship spread to Norway and Sweden in connection with the creation of the Kalmar Union. In 1439 came a turning point when the national council really established themselves as a representative of the richest clergy and noble landowners and required a greatly increased influence on how the kingdom should be controlled. Despite the many disputes between landowners and royal power in this country and especially in Sweden strengthened the central power level. During the Reformation in 1536, manages furthermore to put both the church and its riches under what we now call for the state. Reformation entailed a break with the Catholic Church under the pope’s leadership, and thus is the end of the unity of the Multinational Catholic church sat on Europe in the medieval period. And since the medieval period is often seen as the period when most of Europe was under the Catholic unity church, Reformation meant also the end of the medieval period. From 1349 onwards, Denmark was hit by repeated plague epidemics. This led initially a severe shortage of labor to keep agricultural production in time. The result was a transformation of the country and major social shifts. The Black Death hit Denmark the first time in 1349-50. From better-known conditions elsewhere, it can be estimated that it cost the life of nearly 40% of the Danes. But the plague stroke again in 1360, 1368-69 and 1379 and possibly other years. That meant a sharp decrease of people in the new generations, who might otherwise have filled the gap after the dead, and around 1400 one can assume that the population was about halved. This led to a significant shortage of labor in relation to the land they had cultivated. A large number of farms were deserted and settlements disappeared. It did, however, give most of the remaining population good options. In the cities labor costs increased, and outside the cities there was something like a halving of the charges, the farmers had to pay to the landowners. In addition, production at the large estates gradually restructured. The labor shortage came to mean serious hardship for landlords. Many went more or less bankrupt, while others knew how to exploit the situation by buying up land to rapidly falling prices. The worst was, however, for the less wealthy landowners. The so-called gentry had to largely abandon their lord status and become private peasants or sell their land and go to the city and become merchants. Since there was now plenty of land, could greater part of this is used for cattle breeding. Especially cattle for sale in towns was growing in significance through the 1400s. Until then, the cities mostly were influenced by trade with grain, clothes and herrings(! ).